Humidity, Temperature and Pressure are three basic parameters to build any Weather Station and to measure environmental conditions. We have previously built a mini Weather Station using Arduino and this time we are extending the weather station with Raspberry Pi. 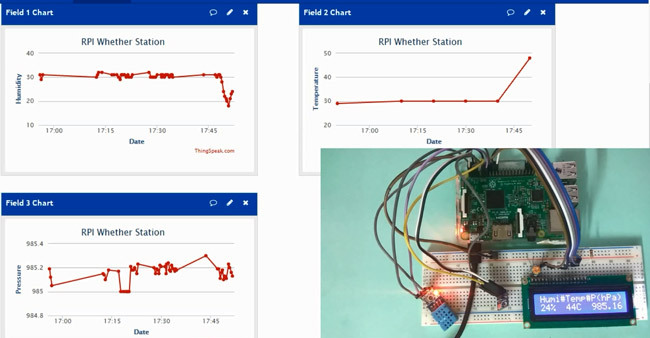 This IoT based Project aims to show the current Humidity, Temperature and Pressure parameters on the LCD as well on the Internet server using Raspberry Pi, which makes it a Raspberry Pi Weather Station. You can install this setup anywhere and can monitor the weather conditions of that place from anywhere in the world over the internet, it will not only show the current data but can also show the past values in the form of Graphs. We have used DHT11 Humidity & temperature sensor for sensing the temperature and BM180 Pressure sensor module for measuring barometric pressure. This Celsius scale Thermometer and percentage scale Humidity meter displays the ambient temperature and humidity through a LCD display and barometric pressure is displayed in millibar or hPa (hectopascal). All this data is sent to ThingSpeak server for live monitoring from anywhere in the world over internet. Do check the Demonstration Video and Python Program, given at the end of this tutorial. This IoT based project has four sections. Firstly DHT11 sensor senses the Humidity & Temperature Data and BM180 sensor measures the atmospheric pressure. Secondly Raspberry Pi reads the DHT11 sensor module’s output by using single wire protocol and BM180 pressure sensor’s output by using I2C protocol and extracts both sensors values into a suitable number in percentage (humidity), Celsius scale (temperature), hectoPascal or millibar (pressure). Thirdly, these values are sent to ThingSpeak server by using inbuilt Wi-Fi of Raspberry Pi 3. And finally ThingSpeak analyses the data and shows it in a Graph form. A LCD is also used to display these values locally. ThingSpeak provides very good tool for IoT based projects. By using ThingSpeak website, we can monitor our data and control our system over the Internet, using the Channels and webpages provided by ThingSpeak. ThingSpeak ‘Collects’ the data from the sensors, ‘Analyze and Visualize’ the data and ‘Acts’ by triggering a reaction. We have previously explained about sending data to ThingSpeak in detail, you can check there. Here we are briefly explaining to use ThingSpeak for this Raspberry Pi Weather station. First you need to create account on ThingSpeak website and create a ‘New channel’ in it. In new channel you have to define some fields for the data you want to monitor, like in this project we will create three fields for Humidity, Temperature and Pressure data. Now click on ‘API keys’ tab and save the Write and Read API keys, here we are only using Write key. You need to Copy this key in ‘key’ variable in the Code. Now we need this ‘Feed Get Request URL’ in our Python code to open “api.thingspeak.com” and then send data using this Feed Request as query string. And Before sending data user needs to enter the temperature, humidity and pressure data in this query String using variables in program, check in the Code at the end this article. You can learn more about DHT11 Sensor and its Interfacing with Arduino here. We are using Python language here for the Program. Before coding, user needs to configure Raspberry Pi. You can check our previous tutorials for Getting Started with Raspberry Pi and Installing & Configuring Raspbian Jessie OS in Pi. Then go to ‘Advance Options’, select ‘I2C’ and ‘Enable’ it. Programming part of this project plays a very important role to perform all the operations. First of all we include all required libraries, initiaze variables and define pins for LCD and DHT11. In def main(): function, below code is used for sending the data to the server and display it over the LCD, continuously in while loop. For LCD, def lcd_init() function is used to initialize LCD in four bit mode, def lcdcmd(ch) function is used for sending command to LCD, def lcddata(ch) function is used for sending data to LCD and def lcdstring(Str) function is used to send data string to LCD. You can check all these functions in Code given afterwards. def readBmp180 function is used for reading pressure from the BM180 sensor. BM180 sensor can also give temperature but here we have only used it for calculating pressure. So this is the basic Raspberry Pi Weather Station, you can further extend it to measure various weather related parameters like wind speed, soil temperature, illuminance (lux), rainfall, air quality etc. Please tell me how is this project is different from the weather station which you built on arduino? And how raspberry pi is utilized in this project? Raspberry is completely different from Arduino. Pi is almost like a computer which has inbuilt Wifi, Bluetooth etc.. To put it simple Pi is a microprocessor which can be used for complex applications. On the other hand Arduino requires an external Wi-Fi module like ESP8266 to connect to internet and Arduino is just an Microcontroller. Although i have already installed the adafruit from commad line. What should I do? please tell me. Hello, I have entered the code for this project and triple checked for errors. Also "executed" Python Updates etc. I am happy with those results. Also had no issues connecting to ThingSpeak and getting that set up. addr to be defined! urllib or urrlib2? which is it? Is i2Cbus the same as I2cbus? GPIO.setup(LCD_E,GPIO.OUT) surely should be GPIO.setup(LCD_EN,GPIO.OUT) ??? What is the purpose of the ".value" at the end of the second line of the first def statement ??? throws up errors! Whats that all about.